ATLANTA - Former President Jimmy Carter has responded well to months of cancer treatment, and his latest scan did not detect the disease. In a statement, Mr. Carter said: "My most recent MRI brain scan did not reveal any signs of the original cancer spots nor any new ones. I will continue to receive regular 3-week immunotherapy treatments of pembrolizumab." His grandson, Jason Carter, first told the The Associated Press in a text message earlier Sunday. The elder Carter apparently shared the good news before giving a Sunday School lesson at Maranatha Baptist Church in his hometown of Plains, Georgia. Jill Stuckey, a church leader who was present, said Carter had announced that a brain scan this week showed no cancer. The former president continued teaching Sunday School regularly after his initial diagnosis of brain cancer this summer. In August, Mr. Carter said doctors told him he had melanoma that had begun in his liver and spread to other parts of his body. Doctors "found that there were four spots of melanoma on my brain...they are very small spots, about two millimeters," Mr. Carter said. He had surgery earlier in the year to remove the mass on his liver. CBS News' chief medical correspondent Dr. Jon LaPook reports that Mr. Carter's family has a strong history of pancreatic cancer. His three siblings and father died from it. In May, Carter cut short a trip to Guyana to observe an election because he wasn't feeling well. But he recently finished a book tour promoting his latest book, "A Full Life: Reflections at 90." 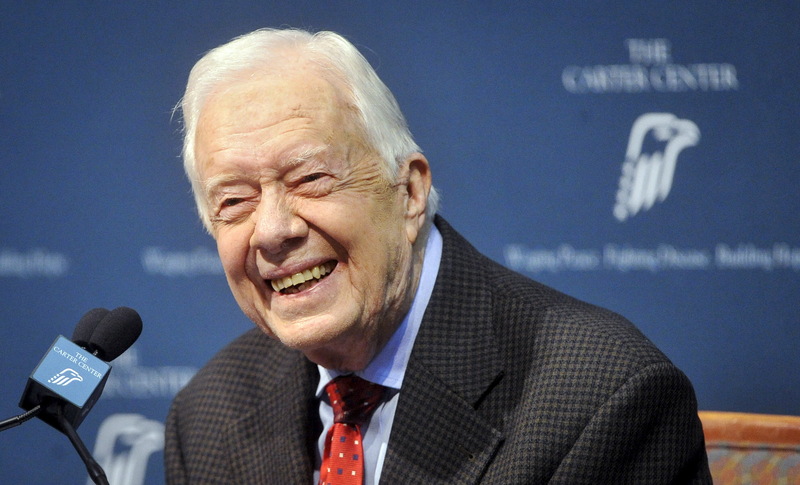 Carter was the 39th president of the United States, serving between 1977 and 1981, and at 90 years old, he's the nation's second-oldest living president. After leaving the White House, he established the Carter Foundation and has traveled the world working on issues like healthcare and global democracy.